For more, go to Veterans for Peace, here. and the link on Korean articles is here. A daily ritual begins early in Gangjeong Village on Jeju Island, South Korea, site of a joint U.S.-South Korean deepwater naval base. At 7 am every morning, activists at the entrance to the military base, begin a “100 bows” prayer. Police are lined up around them to make sure they don’t block construction vehicles. On this particular morning, this spiritual presence is augmented by Catholic peace workers, some of whom spent the previous night here in the raw damp. A mattress lies by the side of the road, occupied by Father Mun, one of the most famous radical priests in Korea. When he gets up, he is surrounded by an entourage of police who move with him as he walks, blocking his way if he tries to go too close to the road into the base. At one point, he shakes his cane at them, shouting in Korean that he is not a contagious disease to be quarantined this way. Villagers have been protesting construction of the Gangjeong facility and the attendant destruction of the surrounding environment for eight years. Every day, no matter the weather, they are out at the base entrance with their placards and banners, plastic lawn chairs, flower arrangements and carved wooden signs, with which they attempt to block vehicles from entering or exiting the site. After the 100 bows are completed, protesters move into the next phase: police step back and allow them to move their chairs into the middle of the gateway, where they sit while the traffic builds up on both sides of the entrance. Every 20 minutes or so, a policeman comes out with a microphone and announces that if they do not leave, they will be removed. When they fail to move, 20-30 police move out and pick up the chairs (with their occupants) and flowers. They carefully deposit the chairs (still containing their occupants) by the side of the entrance and surround them while traffic is allowed to pass through the gate. When the lines of waiting cars, trucks, and construction equipment have all moved in or out, the police withdraw to their shelter behind the fence, and the protesters resume their positions in the middle of the entrance. At 11 am, Mass begins. The removals of the protesters take place less frequently, as it is no longer “rush hour” to get to the construction site, but there is brisk traffic in and out of the gate throughout the entire day. For an hour and a half, the Catholic Mass is broadcast via speakers across the street. The protesters also have a cordless mic, and they chime in from time to time with a song or a portion of the service. Following the Mass, the protest gets a little rowdier, with Korean pop music and dancing. Usually, this ends the daily vigil, but today the protesters stay until all the vehicles exited the gate, well past dark. This is because they were especially motivated by the previous day’s events, when a protester had been hit by a construction truck. She was taken to the hospital, where she required surgery to reconstruct her foot, which was crushed, and two other demonstrators had been arrested and taken to Jeju City. Upset by this escalation, Father Mun and others stayed the night, and Father Mun has vowed to fast until the two are released. The delegation will be on Jeju for a week, before traveling to Okinawa to join protests against expansion of U.S. military bases there. 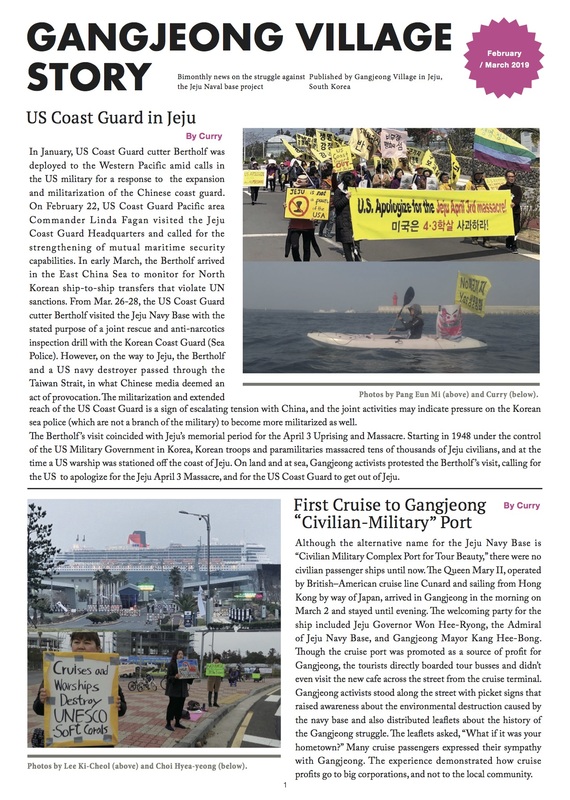 “We are here to learn more about and stand in solidarity with those feeling the direct ecological and human impact of U.S. base expansion as part of Obama’s pivot to surround and provocatively encircle China,” said Gagnon, coordinator of the Global Network Against Weapons and Nuclear Power in Space. And for the people of Gangjeong, a village of 1900 that depends on the ocean for its economic survival, the impact is already evident, as they see the destruction wrought by the base construction on their sacred rocky Gureombi coastline and the endangered coral forests off their shore.